There are several places in the state of Karnataka which are far away from the limelight and hence, are the hidden beauties of the state. These hidden sites are the destinations which make the state popular amongst offbeat travellers. Are you one amongst these travellers who love walking beyond the confinements and exploring unconventional paths? If yes, then the beach village of Maravanthe is your stoppage this season. It is the place where you can find NH 66 running in between Souparnika river and the Arabian Sea. Isn't it a wonderful place with unconventional scenery? Read on to know more about this beautiful village. Being a coastal settlement, the region in and around Maravanthe experiences a hot and humid weather during the summer season and hence, it is least visited during the summers. However, if you love exploring hidden beaches and their beautiful surroundings, then Maravanthe is a year-round destination for you. If you are looking forward to visiting Maravanthe as a tourist, then the best time is from October until the end of March. 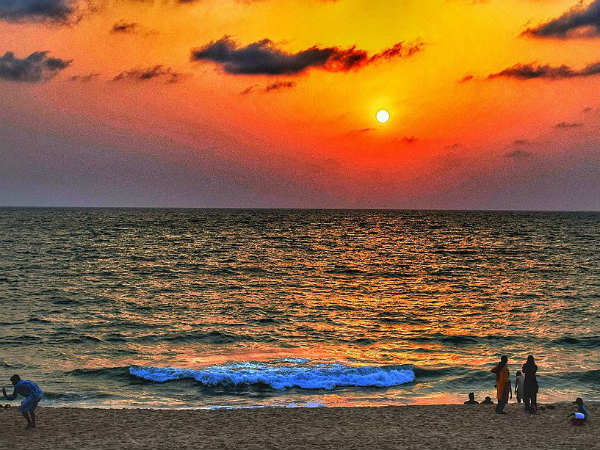 Located in the Udupi district of Karnataka near the coastal town of Kundapura, Maravanthe is a small hamlet located in the vicinity of the Arabian Sea. It is popular amongst locals tourists and passers-by for its virgin beaches which remains uncrowded and tidy throughout the year. As Maravanthe is still not a commercialised region, you can enjoy the beauty of its wonderful beaches peacefully. Over a period of time, it has become popular amongst offbeat travellers who come here to savour its composed environment on a regular basis. Have you ever been to a place where you can enjoy the mesmerising views of a river and a sea facing each other with a road running in between them? If not, then the beauty of this geographical phenomenon is enough to compel you to visit Maravanthe this season. Apart from lazing by its clean and unpolluted beaches, you can also visit Maraswamy Temple and a few nearby islands covered with palm trees and farmlands. From boating cruises to scuba diving and fishing to snorkelling, there are a lot of recreational activities to do within the boundaries the Maravanthe. If you are looking forward to explore beyond its confinements, then you can also explore Kodachadri Hills and Kodi Beach. By Air: You can take a direct flight to Mangalore Airport and then from there you can either hire a cab directly to Maravanthe or catch a bus to Udupi. Once you have reach Udupi by bus, you can take a bus to Maravanthe. Mangalore Airport is located at a distance of about 110 km from Maravanthe. By Rail: The nearest major railway station is also located at Mangalore. From the station, you can either hire a taxi or catch a bus to Maravanthe. It will take you an approximate time of 3 hours to reach your destination from Mangalore. By Road: As Maravanthe is well connected to major cities and towns, it can be easily approached by road.